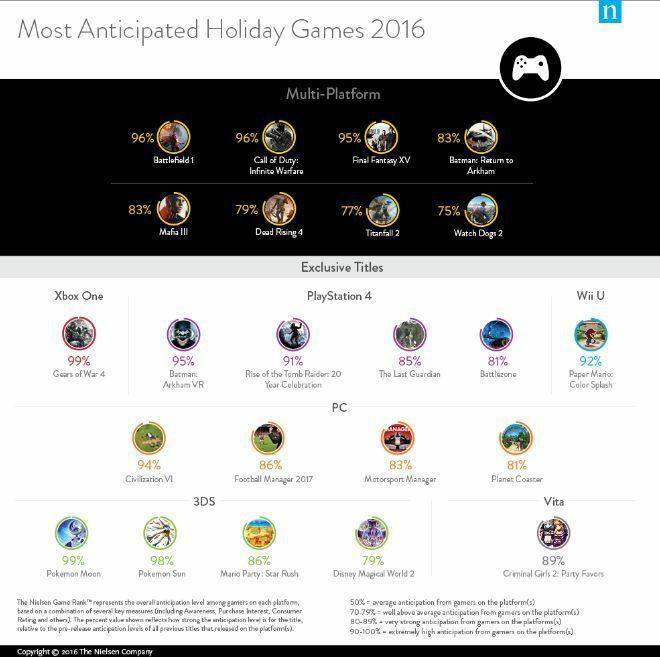 Nielsen, an international research company, announced the results of Most Anticipated Holiday games survey which they organize every year. The survey results showed that shooter games Battlefield 1 and Call of Duty: Infinite Warfare are in the top places of game lovers fan lists. Both of the games had an anticipation level reaching 96 percent. The results were evaluated by a number of aspects, featuring in the Nielsen Game Rank. These factors includes: buying interest, knowledge about the game and customer rating. The percent value corresponds to the other games announced on a specific platform. Multiplatform games such as Battlefield 1 and Warfare had their numbers coming from average of the values from every platform. The percentage shows the level of anticipation. It is explained like this: 50 percent stands for an average anticipation, 70-79 percent means well above average anticipation, 80-89 percent stands for a very strong anticipation and 90-100 percent means extremely high anticipation. 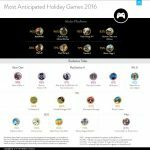 Battlefield 1 was evaluated by 96 percent which means that it stands for an extremely high anticipation. One of the biggest competitors for Battlefield 1 in the survey was the Final Fantasy XV that reached 95 percent. Batman: Return to Arkham has 83 percent, Dead Rising 4 scored 79 percent and Watch Dogs 2 has 75 percent in the multiplatform games league. At the top of platform-exclusives stands Gear of War 4 with 99 percent on Xbox One. Batman: Arkham VR for PlayStation 4 reached 95 percent. On the top of Wii U platform games stands Paper Mario: Color Splash with 92 percent. Leader of PC platform is Civilization IV who has 94 percent. Pokemon Sun with 99 percent defeated Pokemon Moon (who had 98 percent) on 3DS. The top most-expected game from PlayStation Vita Platform is Criminal Girls 2: Party Favors with 89 percent ranking. The Most Anticipated Holiday survey by Nielsen concluded the answers from 6 000 people, from 7 to 54 years-old. The Survey was conducted from August 21 to September 24.